Gardena – O Hei There! This is essentially “part 2” of my version of Jonathan Gold’s review of Japanese food court rookies Hannosuke and Ramen Iroha (here’s “part 1” re: Hannosuke). I visited the latter earlier today because I wanted to buy groceries at the superstore version of Marukai (probably the other way around realistically). Ramen Iroha usually pops up at this Marukai once a year in late summer, but it appears that it’s here for good now this time around. But another ramen place? Is this even necessary? 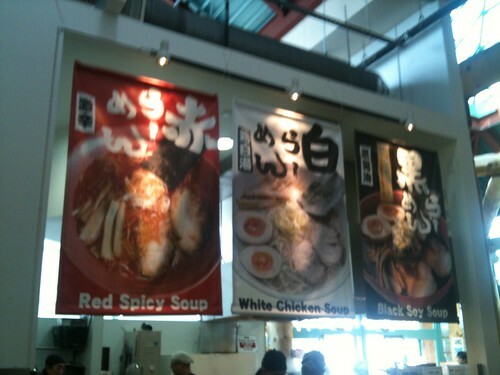 The Hei (or black, for you non-Mandarin speakers) version of the ramen served here seeks to set the place apart from the standard ramen shops you see EVERYWHERE in LA now. This three-time winner of People’s Choice Awards in Tokyo has a chicken-based broth, which gets its dark color from soy sauce, fermented black beans, and black pepper. You’d expect such a broth to be heavy and salty, but it wasn’t at all – probably because it’s chicken-based. The dominant flavor here is the soy, but there was something else that I still haven’t been able to distinguish. Maybe it’s from the bamboo shoots and wood-ear mushrooms, or maybe it’s the addition of the generous dash of black pepper on top. Either way, when I closed my eyes, this reminded me of…hot and sour soup? The noodles here are thick, curly and chewy. Less chewy, more al dente than the ones you have with your tsukemen at Tsujita, but you get the picture. I ordered the ajitama chashu version, which comes with a whole marinated egg and a few slices of chashu. They actually forgot the egg initially, but no biggie. Still, a minor pet peeve re: eating a cold hanjuku egg. The chashu, though, was quite glorious. The slices were sliced thinly, thin enough to the point the broth was able to melt the fat – awesome. Maybe I’m just too used to tonkotsu ramen, but I wasn’t blown away by this ramen (and I wanted to LOVE it). I actually want my ramen to be heavy and salty, enough to put me in a food coma. Maybe the quality control has been loosened since the guy went back to Japan? But to answer the earlier question of whether Ramen Iroha was necessary – sure. 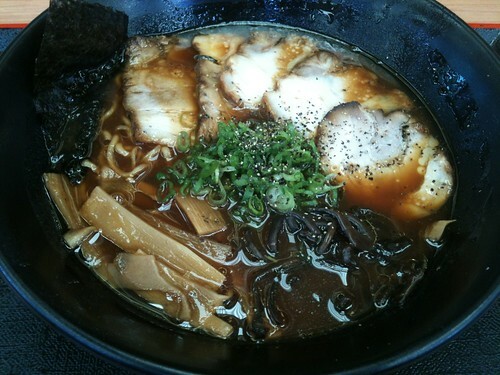 Like I said before, it is different from the ramen we’re accustomed to, so there is a place for it. But I have to admit to being a little bit disappointed. But I’ll be back – and maybe the next time I go black, I don’t go back.